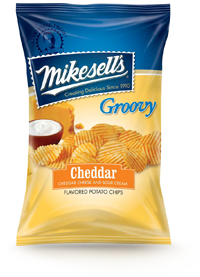 Mikesell's are one of the world's oldest Chips companies, so they have understandably had a few branding changes over the years. This latest design features a photographic image of the flavor and contents, which works depending on the flavoring - this is a not-so-good-case because you have photographic imagery mixed with cartoon flames. The latest logo design has an odd stamp type serrated edge. The flavor has a color coded box, but we think they missed a trick here. The creamy colored bottom section of the bag looks innocuous as a background, but the top is a dark blue for all the 'Groovy' flavors. This should be flavor color coded instead. Not the hard and brittle, snappy kind of crunch that you may get on a Kettle Cooked Chip. Neither was it crumbly like a regular Chip. This was more more like a hardened potato foodstuff. It had a break, rather than a crack when bitten into. 'Groovy' relates to the Ridged design of the Chips - geddit. The Groovy Chips were thicker than Kettle Cooked Chips, they had to be to support the wide Ridges. There were not many broken Chips in its large air filled protective covering. There were no oil bubbles around. And while the seasoning was not in great quantity it was a darker yellow orange color than the Chips. There was a very mild cheesy aroma on the Nose Plunge Test. It may have been the thicker nature of the Groovy Chips, but the flavor combination between the Sour Cream and the potato added a creamy flavoring that mixed well with the Cheese, to create a hearty, warm, almost comforting winter snack. It was a tangy flavorful, Cheese dominated Chip.